Reef colors supplements have been formulated such that the ratio of the elements in each supplement is the same as that found in the skeleton and soft tissue of corals. Our research has identified a constant ratio between each of the Reef Colors and the overall consumption of calcium, which is proportional to coral growth and metabolic activity. This provides a simple and safe method, based on a measured calcium uptake, of dosing all color supplements. The Reef Colors program Provides the minor and trace elements that are taken up by the coral skeleton and soft tissue and are essential for SPS corals to display their natural colors. 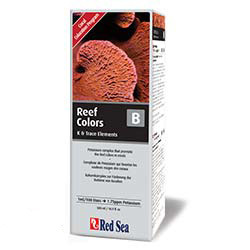 Reef Colors B is a Potassium complex that promote the red colors in corals. Reef Color B: A complex of Potassium and Boron. Potassium plays an essential role in the transportation of coral nutrients within the soft tissue (including the nutrients provided by the Zooxanthellae). Potassium and Boron significantly affect the alkalinity of a coral�s soft tissue and the formation of aragonite in its skeleton. Potassium is related to the red chromo-proteins.